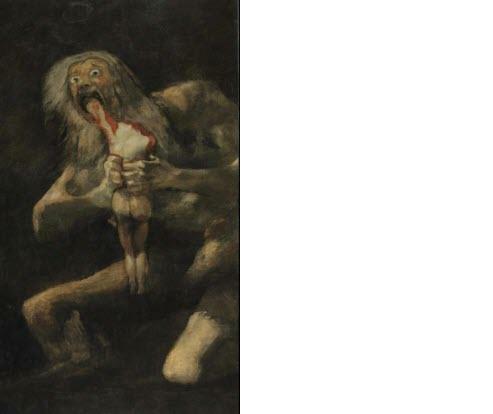 – Saturn Devouring His Son (image above) is the name given to a painting by Spanish artist Francisco Goya. It depicts the Greek myth of the Titan Cronus, who, fearing that he would be overthrown by one of his children, ate each one upon their birth. Deny it all you want, but the global economy appears to be headed into recession. It became clear the cycle had started to turn once the FAANG stock bubble popped and the U.S. stock market plunged 20% late last year. The optimists among us insist this is merely a growth scare or blip as we saw in 2016, but that scenario looks increasingly unlikely. As usual, the bond market tends to give us signals before more obvious evidence emerges. As such, I received a lot of insight from the following tweet. 36% of the US yield curve is now inverted across 30-year to overnight rates! It is just as high as it was at the start of the tech and housing busts. Moreover, we’re also starting to see hard evidence of a slowdown. Earlier today, the EU Commission slashed growth forecasts for the region, and bad data emerged from of Germany. What I find most fascinating about all of this is how the U.S. stock market has gone vertical for the last six weeks based on the idea the Federal Reserve can come in and save the day, yet the Fed hasn’t committed to doing anything at this point. As such, the market seems to be pricing in very little risk of a full-blown recession, an event that seems more likely over the next twelve months than at any point in the past decade. From what I can tell, nobody wants to actually consider the prospect of a global recession because establishment institutions and the status quo paradigm simply can’t handle one. This is because nothing structurally changed in the aftermath of the last one. The biggest consequence of central bank and government policy following the financial crisis of ten years ago was that the already rich and powerful became even wealthier and more powerful. As state-sponsored inequality boomed, significant portions of the global population finally realized the whole thing is a rigged sham, and populist movements swept the globe. As I’ve said time and time again, humanity is currently living in the midst of the largest global debt bubble in human history, and nothing’s improved on that front since the last crisis. In fact, the situation has gotten demonstrably worse. The reason I’ve become so focused on the economic cycle is because we’re already in the middle of a revolutionary/populist political cycle, which began in earnest with the Brexit vote in mid-2016 and the election of Donald Trump later that year. More recently, we’ve seen populists win in Italy and the blossoming of an impressively sustained and very determined Yellow Vests movement in France. All of this political energy is a direct consequence of central bank policy, entrenched oligarchy and government corruption. We’re now at the point where significant percentages of the population in countries around the world want to metaphorically burn the whole thing down. Once the economic cycle kicks in and joins the political cycle already underway, then you’ll see the real fireworks. That perfectly sums up the situation in many regions of the U.S., and it’s also why the Fed can’t do what it did the last time around. While many Americans were against the bailouts a decade ago, we now have tens years of evidence to examine how it all played out — and the results aren’t pretty. Most troubling is we have an entire generation of young people saddled with massive piles of student loan debt who can’t buy homes or start families due to financial circumstances. Meanwhile, American life expectancy has been dropping for three years in a row, and birth rates are at a thirty year low. This does not paint the picture of a prosperous, healthy, and functioning society. An entrenched system hangs on until you get revolution, collapse or both. Welcome to the next 5 years. U.S. dominance of the global financial system and the USD as sole and indispensable global reserve currency will end. Unipolar geopolitical world order through which the U.S. empire and its military beats all non-client states into submission one way or the other will end. Multi-polar world order to emerge. Death of the neocon and neoliberal political consensus, both domestically and in the realm of foreign policy. Peak Corporatism — Populist politics on both the right and left will unite around the idea that corporations are too powerful and harm competition. Tech giants, banks, etc, will finally be put in their place one way or the other. Massive Spending — Populism + recession = massive government spending. Everyone will talk about how we have unlimited funds to bailout banks and start wars, but no money to actually help people and improve infrastructure. This will resonate with most people. These are just a few of the very big picture changes I foresee, and they can happen a lot faster than people realize, particularly once the economy tanks. I think many expect the status quo to survive the next downturn and consolidate power and wealth even more, like they did the last time around. On this point I strongly take the other side. The status quo and its institutions will not survive the next turn of the cycle. Beyond that, it’s still anyone’s guess as to what emerges on the other side.